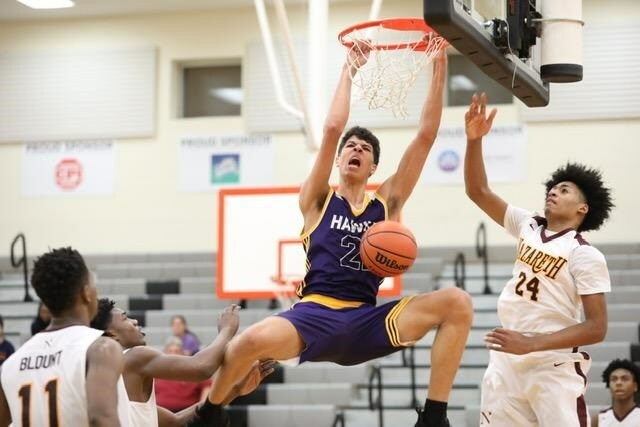 One of those Virginia-bound prospects is Kadin Shedrick, a 4-star center from Holly Springs High located in the heart of the Atlantic Coast Conference’s Tobacco Road. The other is 4-star shooting guard Casey Morsell from Washington, D.C.
Shedrick, a 6-foot-11, 200-pounder ranked the No. 56 player nationally by 247Sports.com and No. 62 by Rivals.com, not only celebrated the victories, his commitment showed he understood Virginia’s ceiling better than many national media members – not to mention doubting fans. They had lined up in a firing squad a year ago after Virginia was the first No. 1 seed to lose to a No. 16 seed in an NCAA Tournament, falling to Maryland-Baltimore County. They condemned Cavaliers coach Tony Bennett’s deliberate style of play to never winning a national title. As they say, out of the mouths of babes. And we shouldn’t let off the hook the one-and-dones that follow each other to form a super team at either Duke or Kentucky. They view those destinations as their best shot at a national championship in their college pit stop. Well, they’re moving on to the NBA empty-handed after not considering Virginia as a path. The one-and-done team-stacking trend that Kentucky coach John Calipari launched in the 2009-10 season has been rewarded only twice in the past decade, Kentucky in 2012 and Duke in 2015. Shedrick has ended up with the best of both worlds. He was a Virginia fan before he committed, yet he based his decision on more than winning a national title. As a top student leaning toward math fields, he factored in academics at an elite institution. Now he arrives on campus with confirmation Virginia more than a regular-season national power. The Cavaliers don’t typically attract one-and-dones, but Bennett does develop players and send them to the NBA. Bennett has had five players drafted since 2012, with potentially two more in 2019. In the upcoming draft, redshirt sophomore De’Andre Hunter (6-7, 225) is projected as high as the No. 8 pick and junior Ty Jerome (6-5, 195) as a late first-rounder, although they haven’t announced their intentions yet. In 2016, Virginia grad Malcom Brogdon was a second-round pick, but he turned out to be the 2016-17 NBA Rookie of the Year. Devon Hall was a second-rounder in 2018; Justin Anderson, first-rounder, 2015, Joe Harris, second-rounder, 2014; and Mike Scott, second-rounder, 2012. The high school recruits Virginia does attract are lower-ranked 4-stars and 3-stars that need time to reach their potential. Shedrick, a late bloomer that didn’t burst onto the scene as an elite recruit until the summer before his senior year, recognizes he needs to add strength and weight. Virginia had only one senior in its playing rotation, center Jack Salt. The early draft decisions of Hunter and Jerome will determine if there are more returning starters than Kyle Guy (6-2, 175) and Mamadi Diakite (6-9, 228). Guy, a senior guard next year, led the Cavs in scoring with 15.4 points a game and Diakite, a redshirt senior forward next season, was fourth at 7.4 with 4.4 rebounds. Also returning from the eight-man rotation are guard Kihei Clark (5-9, 155), a sophomore in the fall with 20 starts, and Braxton Key (6-8, 225), a senior in the fall with six starts, and Jay Huff (7-1, 232), a redshirt junior in the fall that played in 34 games off the bench with 4.4 points and 2.1 rebounds. Shedrick, who dressed in Virginia gear while watching the NCAA games on TV, enjoyed the double-pleasure of the Cavaliers winning and envisioning himself fitting in among the players both on and off the court. The other element of a team he recognized was the calm and cool nature of the Cavaliers in crunch time. On his recruiting trips and attending Senior Night, he gained a feel for the players’ individual personalities and team chemistry. Virginia needed remarkable last-second plays to force overtime to beat Purdue in the Elite Eight and Texas Tech in the championship. They also defeated Oregon 53-49 in the Sweet Sixteen and Auburn 63-62 in the national semifinal. A year ago Shedrick and Morsell ignored the pundits that said Tony Bennett can never win a national title. Yes, Bennett needed his 10th season at Virginia to finally win it all, but that rush to judgment overlooked Hall-of-Fame coaches John Wooden was at UCLA 16 seasons before he won his first of 10 and Dean Smith 21 at North Carolina before the first of his two. Now that question is, can Bennett win multiple national titles? Shedrick committed with his opinion a year ago.